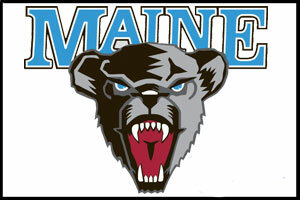 The University of Maine baseball team swept a pair of games on Sunday afternoon in the Fairleigh Dickinson Tournament. The Black Bears defeated Fairleigh Dickinson 5-1 in the first game of the day and followed that up with a 5-1 victory over St. Peter's in the second game. Maine improves to 9-16 on the season with the wins. After four scoreless innings in the first game, Maine got on the board in the top of the fifth inning. Mike Connolly (Middleborough, Mass.) singled up the middle and advanced to second base on a balk. He moved to third on a Taylor Lewis (Montville, Conn.) bunt single and scored when Eric White (Brewer, Maine) singled to the pitcher. Fairleigh Dickinson tied the game at 1-1 in the bottom of the frame. Jonathan Torres reached on a fielder's choice and then stole second. He scored when Matt Holsman singled. Maine then scored four runs in the top of the sixth inning. Joey Martin (Portland, Maine) led off the inning with a triple and Justin Leisenheimer (Middle Village, N.Y.) followed with a triple scoring Martin. Alex Calbick (Burnaby, British Columbia) singled, driving home Justin Leisenheimer. Calbick moved to second on a Colin Gay (Franklin, Mass.) sacrifice bunt and then stole third base. He scored when Connolly had an RBI single. Connolly then stole second, moved to third on a wild pitch and scored on an error. Stephen Perakslis (Abington, Mass.) got the start on the mound for the Black Bears in the first game. He went seven innings and allowed one run on seven hits. He struck out three batters and improves to 2-4 on the season. Matt Cadigan started for the Knights. He went 5.1 innings and allowed four runs on seven hits while striking out five. He falls to 0-3 on the season. He was replaced by Zach Kisling who went 2.2 innings. He allowed one run on a pair of hits. Spencer Kelly pitched the ninth for the Knights and allowed just one hit. In the second game, rookie Shaun Coughlin (Northfield, Conn.) pitched a complete game to lead Maine to the victory. St. Peter's took a 1-0 lead in the top of the fourth inning when Russ Stupienski and Chris Grimes had back-to-back singles. Stupienski scored the first run of the game when Brian Schroeder grounded into a double play. Maine took the lead in the bottom of the inning. Tyler Patzalek (Burlington, Ontario) reached on an error and then advanced to second base. Fran Whitten (Westborough, Mass.) and Martin drew back-to-back walks to load the bases. Calbick then had a two-run single through the right side. Maine added two more runs in the bottom of the fifth inning. Pat Thibodeau (Caribou, Maine) walked and Lewis followed with a single and then advanced to second, while Thibodeau advanced to third. Troy Black (Mississauga, Ontario) hit a sacrifice fly scoring Thibodeau. Lewis also scored on the play on an error. Maine made it a 5-1 final with a run in the bottom of the eighth inning. Lewis drew a walk to lead off the inning. He advanced to third on a wild pitch and scored when Patzalek singled up the middle. Coughlin pitched the complete game, the first of the season for the Black Bears. He allowed just one run on five hits over nine innings. He struck out eight batters in the game and improves to 1-0 on the season and lowers his team-best ERA to 1.57. Joe Jimenez got the start and picked up the loss for St. Peter's. He went 4.1 innings and allowed three runs on just one hit, while walking six. Kevin Croucher pitched 2.2 innings, while Michael Martucci pitched the final frame. After 25 games on the road, the Black Bears will play their Mahaney Diamond opener on Friday, April 1 when they host Bryant at 3:30 PM. Maine will also host the Bulldogs both Saturday and Sunday at 1 PM.